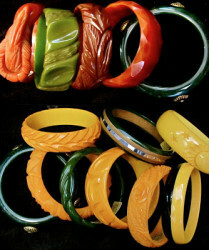 We have been selling Bakelite at the shop since its initial resurgence in popularity back in the early 80’s. Come visit an array of bangles, brooches, inkwells, pens, Mah Jongg sets and many other oddities made from this funky fun material. 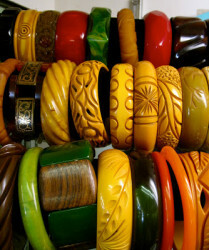 Bakelite or Catalin is an early form of plastic, one of the first made from synthetic materials. It was originally fashioned for its electrically non-conductive and heat resistant properties for insulators, radios and telephone casings. It is usually recognizable by its beautiful array of retro colors, its loud and well known clank as bangles slide down your wrist to meet your hand and its lovely formaldehyde smell. In todays world we use the term Bakelite for all the mad colorful jewelry and Catalin for the colorful radios and decorative accessories of the same material. 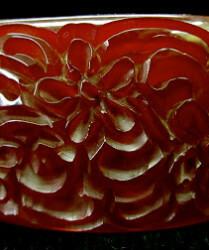 When using the brown industrial material like in telephones the term Bakelite is used. 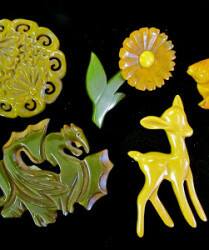 Originally this unique and first thermoset plastic was considered and exotic material. 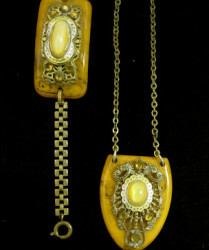 High end fashion designers like Martha Sleeper used it to make distinctive fashion jewelry . 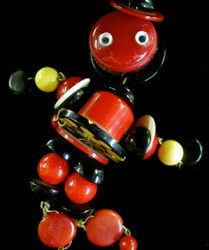 This jewelry sold for high dollars in places like Sacks Fifth Avenue. I purchased a spinach green strand of beads from a woman that told me she saved her paycheck from Saks for a year and paid $100 for it during the depression. Todays prices are truly a bargain! To add to the fun these patinated colors are often referred to by edible names like applejuice, rootbeer or butterscotch. Truly one of the most fun things you can collect. It is incredible to see how no two pieces are alike. 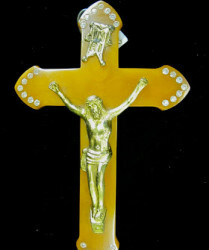 Each piece has its own color, sometimes hand carved distinction, shape, and character. 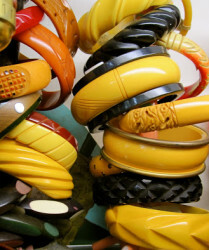 The hunt to see all the varieties of Bakelite is fun and possibly never ending!